The Starbucks manager of Elmhurst store in New York had been fired after a viral video of her yelling at a customer had circulated online. Her ranting had surprised many netizens who had seen the video. 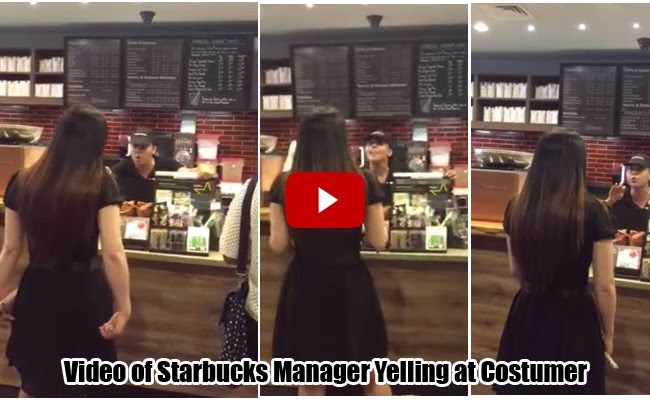 In the said video, Ruby Chen, the customer in black dress was yelled at by the manager and was accused of stealing a cookie straw that costs less than a dollar. The customer was able to get a copy of the video recorded by another customer and had posted it on YouTube and Facebook. She also wrote a complaint in the Starbucks Facebook page and asked to take her negative customer experience seriously. According to Chen, the incident happened on May 12. She had ordered a frappuccino and a special cookie straw. She proceeded to open her Starbucks reward app on her phone and was unable to hear when a crew asked her name to tag her cup. The manager she named as Melissa started yelling at her. When she said that Melissa did not have to yell at her, the manager yanked away the scanner and told her to leave. She was even accused of stealing the straw wich she had picked up before the incident even happened. In the said video, Melissa is heard telling Chen to leave before she calls the cops. Chen seemed to be confuse on what was happening and other customers tried to defend her, making comments that the manager should get fired. Melissa’s mood got worse and told those who defended Chen to leave the store. Another crew was seen trying to hold and calm Melissa but failed. According to the Starbucks spokeswoman, the crew Chen believed as the manager was actually a shift supervisor. The management had fired her and tried to get in touch with Chen. Chen confirmed this and shared that she was offered a $100 gift card to compensate for the incident. Starbucks clarified that the incident is far from the quality service they are proud of.